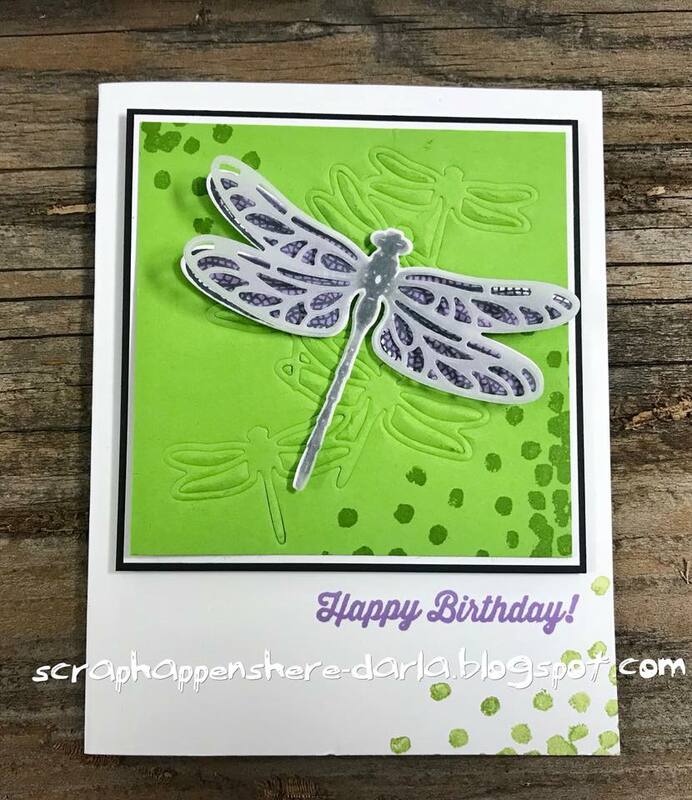 Scrap Happens Here with Darla: Embossed Dragonflies! Hey there...hi there...ho there! How's your Thursday going? I'm having a hard time getting going this morning...probably because it isn't morning anymore...it's AFTERNOON!! I had a FABULOUS class yesterday! I was blessed to meet three new ladies! 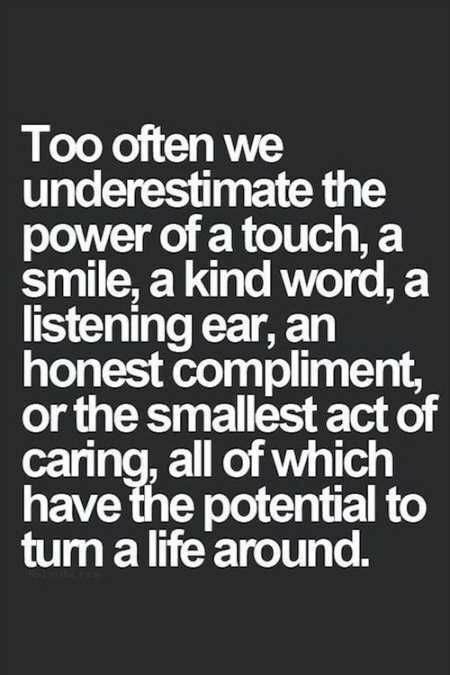 I had a total of 18...it's amazing to me how a common interest brings us together, creates friendships and brings so much joy. It's so fun to hear everyone visiting...I don't even mind when they miss the directions, they're having fun reconnecting and catching up! It's an incredible gift I've been given and I am so grateful that I get to be a part of these gals lives!! My card today is one we created in class! ENJOY!! 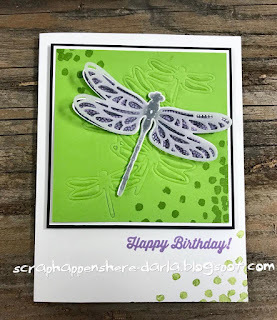 This FUN card is created with the Dragonfly Dream Stamp Set and the Detailed Dragonfly Thinlits! 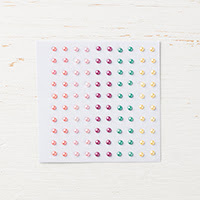 I also used the NEW and AMAZING Big Shot Embossing Mats! These mats are on page 221 of the Annual Catalog and are easy to miss! TRUST ME...you DON'T want to miss them! They turn your framelits/thinlits into embossing folders! VERY COOL! You do have to pay close attention to how you layer them or you will cut them...ask me how I know? I have to order a new set...THANKFULLY they are only $15.00. If you look at the Lemon Lime Twist cardstock...you can see that the small dragonflies are embossed and not cut...SUPER COOL don't you think? Let me give you my measurements! I stamped the dragonfly body in Memento Black ink, then the wings in Highland Heather (what a great name for a color)! I used my Dragronfly Thinlits to cut it out! I used the detailed thinlit to cut another dragonfly from Vellum paper and adhered it to the stamped image with just a bit of Multipurpose Glue (I call it the GREEN glue in my classes because of the green lid!). I used the dots from the stamp set to add some texture using Lemon Lime Twist ink! I'd love to hear what you think! Leave a comment if you have time! Thanks BUNCHES for stopping by! I hope the rest of your day is WONDERFUL!